Two images represent parallel exploration of contemporary design and its relationship to history through the medium of film and the process of radical intervention into existing structures. 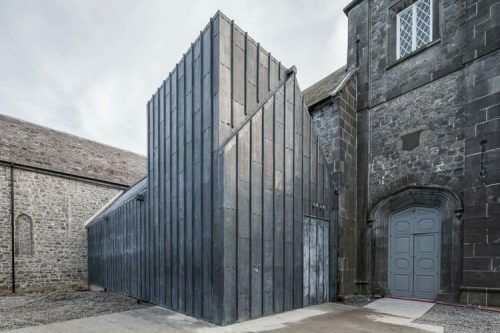 St Mary’s Medieval Mile Museum in Kilkenny - selected for the 2018 International Domus Restoration and Preservation Prize curated by the University of Ferrara - is built around a semi-ruined medieval church. Found elements like the exposed roof timbers have been retained; new elements, carefully researched, have been constructed in folded timber and lead on medieval foundations to restore the original outline of the church destroyed at the Reformation. Internally, the new elements create new spatial relationships; the taut timber-lined chancel room becomes a focus at the Eastern end. This contemporary exploration of historic form is mirrored in the Displaced Longitude exhibition in the Chapel Royal in Dublin Castle, where three films play across Gothic structure - moving form spliced and cut by vaulted ceilings. The three films - originally shown in the Alvaro Siza Sao Bento Metro Station in Porto, Portugal - can all be seen from one point. They present practice projects (including St Mary’s) simultaneously but from different angles and at different levels of engagement to architectural perception - as ideas, as realities, and somewhere between - perception enhanced by the monstrous capacity of drones.